Donald Trump’s victory in November may deliver the biggest shake-up in retirement planning in more than a generation. In the past, we’ve counseled Savvy Social Security members to side-step political questions. Teaching the public about how benefits work is tough enough. Getting into complicated discussions of the government budget and the Social Security Trust Fund benefits no one, especially on the verge of moving from pre-retirement to retirement. For the first time in more than a decade, Republicans control the complete government apparatus. Long-desired changes to the tax code and Social Security and Medicare, now may have a shot at passing, despite widespread support for the retirement programs. There’s simply no doubt that advisors will face more questions about Social Security and Medicare during 2018. Since 2008, Horsesmouth’s Savvy Social Security Planning program (click to learn about full program) has trained thousands of financial advisors from all corners of the industry: financial planners, independent RIAs, wealth managers, wirehouse advisors, insurance planners, CPAs, attorneys, divorce specialists, and more. The most successful advisors fully embraced the Social Security message in their communities. With more than 10,000 Baby Boomers turning 62 every day, they realized their clients and their best prospects would hunger for knowledge and guidance about how and when to claim their Social Security benefits. People’s uniformed decisions mean their retirement nest eggs unnecessarily will be placed under greater stress. Thousands of advisors have enjoyed record years of growth, year after year, because they adopted the Savvy Social Security approach and used educating clients and prospects as their lead introduction to themselves, their services, and their firms. That means that Baby Boomers will soon occupy all Social Security claiming ages from 62-70. Well, lots of people will do it on their own and maintain a life-long pattern of making important investment mistakes because they don’t understand the rules and how they apply to their own situation. But for the advisor who understands the complexities of the system and how to apply them to each client-specific circumstance, their clients will benefit over the remainder of their lifetime by having maximized their monthly Social Security payments. You don’t stand to gain a thing directly. You just want them to have a more secure, comfortable retirement…. In fact, we want you to recognize the unique role you play in clients’ lives and get ahead of the curve on the important issue of Social Security and retirement income. We want you, or folks on your team, to be the “go-to” person for all your clients, their friends, their colleagues and their family members. This multi-faceted client education program equips you with the knowledge, tools, resources, calculators and reference material to get you, and then your clients, completely clear about the crucial role their Social Security will play in their retirement. You’ll make “Savvy Social Security Planning for Boomers Mastery” a key client-service offering for pre-retirees and their friends and families. The coming retirement wave presents a unique and sustained opportunity for you to extend and enhance your reputation. By helping confused clients and prospects better understand all their retirement benefit options under Social Security, you’ll be giving them “Peace of Mind” as they move toward solving the rest of the retirement income planning puzzle. The Financial Advisor’s Guide to Savvy Social Security Planning. This 175+ page action research report by Elaine Floyd, CFP® is your Social Security bible—yours to keep. 4 reasons why the financial services industry has downplayed Social Security, to its disadvantage. Social Security is not a giant pyramid scheme; find out the crucial element that makes it work through the generations. Understanding the math: How a high-earning client could contribute $230K over a lifetime and possibly collect $1.7 million in benefits. Why it’s important for clients to understand the essential nature of Social Security regarding current benefits and current contributions. What the “drop out years” are (hint: they have nothing to do with the hippie movement). Maximizing benefits: The key objective of Social Security planning. Warning: The monthly benefit may be higher or lower than the PIA depending on when a person applies. Spousal benefits: One of the most unappreciated aspects of Social Security. Who is affected by the Windfall Eliminations Provision—Help clients avoid a rude awakening. Understanding the challenge of coordinating benefits for couples. Did you know that spousal benefits are not restricted to the low-earning spouse? Even a high-earning spouse planning to retire at 70 can apply for his or her spousal benefit at 66. Common strategies for coordinating benefits for spouses, and how the Budget Act of 2015 is changing those strategies. Dependents’ benefits: Why even Donald Trump’s toddler son could receive Social Security. Remember: Taxation applies to dependents’ and survivors’ benefits. Supplemental Social Security Income: Rules for qualifying. Three years later I went to get my wife on Medicare and was told (erroneously) that a) she had to wait for me to retire and/or start my own Medicare and b) she would have to be covered by a true group health plan for two years while waiting, forcing me to purchase a $1100 per month Blue Cross Group to replace my $400+ per month individual health plan.” When the “error” was discovered, it was impossible to make retroactive changes. How and when checks are received: automatic deposits make it easy. What to do when changing bank accounts and redirecting direct deposit. Watch out: Marrying and divorcing while receiving benefits can change calculations. Now she’s edited and sorted a year’s worth of the best questions. And they’re available to you now to boost your Social Security mastery. Here’s the overview of what’s covered and some questions to give you an idea of what you’ll find. The most fundamental question facing baby boomers is when to apply for benefits. It’s not 65 anymore. Full retirement age for boomers is 66. I presented a seminar last evening and have a question relating to disability. The wife has been disabled since age 50, not sure of current age, but the husband worked to age 68 and will be turning 70 this year. He has not yet applied for benefits. His wife is getting $618 per month. When he applies for his benefit at age 70, can she receive or substitute the DI benefit for the spousal benefit if larger? The husband was a government employee so he was aware of the offset. Any suggestions?—David P.
When a parent is age 62 or older and begins collecting Social Security and still has minor age children, do they receive any benefits at that time? Does the adult have to file for and receive Social Security for the benefits to start?—John F.
We may have run across a client who never applied for Social Security and is 80 years old. He owns a successful business and didn’t “need” the extra cash. We are still gathering facts. Can he apply for retroactive benefits? If he applies now, will his benefit include an adjustment to make up for the lost $$$? Does he simply lose those benefits not taken since age 70? Is it possible to do a “do-over” for both survivor benefits and spousal benefits?—Toby G.
“What if I keep working?” is the most commonly asked question by clients today. Everyone knows there is some rule about Social Security benefits being withheld if they work, but many clients are unclear about the details. The basic earnings test is pretty straightforward—for anyone under full retirement age (FRA), $1 in benefits is withheld for every $2 earned over $14,160 in 2009 and 2011—but as with anything related to Social Security, there’s more to it than that. I have a couple, both age 62, where the husband plans to continue to work, possibly to age 70. The wife is considering going ahead and taking her Social Security reduced benefit now. If she does so, does the income limit before benefits are reduced apply to just her income, or to their joint income since they file jointly? What other considerations do we need to pay attention to?—Kevin J.
I have a couple who received conflicting advice from Social Security (two different answers on two different visits) and they came to me for “the right answer.” The issue is interpretation of the working spouse drawing her benefits at age 62 (husband continues to work until NRA and they’re the same birth year) and taxation of those benefits because they file jointly and there is earned income pushing them over the earnings threshold. One SS worker told them that she should wait because her benefits would be subject to the earning test because they file jointly. She’d receive the benefit but it would be reduced 3 to 1. Another SS worker told them earning test only applies by Social Security number and the joint filing doesn’t matter. They don’t know which to believe and are hesitant to file until they know which is correct. I can’t find a definitive answer to this issue on SS website. Which one is correct?—Larry F.
If the primary worker’s benefit at FRA is $2,000, the spousal benefit would be $1,000. If the primary worker delays benefits until age 70 and his benefit is $2,600, would the spousal benefit be $1,300? Or does it top out at $1,000, which is half of FRA?—Andy U. The more I deal with Social Security, the more I realize there is to understand. Can I assume a wife can take a spousal benefit at 62 if it is higher than her own benefit and then switch to her own benefit at any time after her FRA if her own benefit is higher at that point? Is the alternative also possible whereby she takes her work benefit at 62 (because it’s higher) and then changes to a spousal benefit sometime after FRA if the latter benefit is higher? I guess the key thing you’re telling me is that a spouse will receive the higher of either her spousal or her own benefit before FRA, and if she starts her own benefit early, she is stuck with that unless her spousal benefit at some time becomes higher.—John G.
Let’s say a wife starts to collect on her husband’s Social Security at age 62. He applies for his benefit but doesn’t actually take it. He starts receiving his benefit at 66. When he passes away, does she jump up to the amount he is receiving, or will she always get a little bit less because she started collecting early at 62?—Joe C.
If the wife is 66 and the husband is 65, can the wife apply for spousal benefits on the husband’s record? Can he file and suspend in order for his wife to receive spousal benefits at her age 66 or does she need to wait until her age 67 and his age 66?—Ron C.
I recently called the Social Security office to inquire about drawing my spousal benefits after I turn 66 in September of this year. My wife is 70 and has already filed for her retirement benefit based on her work record. It is my intention to file and suspend and draw spousal benefits based on her work record. The person I talked to at the Social Security office was familiar with the file-and-suspend procedure but stated that my wife had to be age 66 (FRA) before I could file for spousal benefits on her work record. Is it time to ask to speak to a Title 2 Technical expert or a Title 2 Claims representative?—Sam K.
Can file-and-suspend be used by the lower-earning spouse to enable the higher-earning and older spouse to get extra benefits? For example, the higher-earning husband is 66 and will work to 70. The lower-earning wife is 62 and will work to 66. Can the lower-earning wife file-and-suspend and the higher-earning husband take four years of spousal benefits without impacting his own benefit at age 70?—John E.
If a person was a teacher before retirement, and covered by a state teachers retirement plan, she is not eligible for Social Security. Does that regulation apply for spousal benefits as well? Survivor benefits are one of the most valuable and important aspects of Social Security. It has been estimated that the average survivor benefit is equivalent to a life insurance policy with a face value of $433,000. Maximizing the survivor benefit is a crucial aspect of Social Security planning for married couples, and it is important to stress to clients that the amount that stands to be paid far in the future depends on decisions made today…. A wife works and gets a small Social Security benefit. Her husband is retiring from the government as a CSRS employee. When he dies, she will get his government pension survivor benefits. Will that reduce her SS benefit?—Steve R.
I was hoping you might be able to help me with a situation I have with a client. She’s 62 and works full time. Her husband passed away and she is entitled to his benefit, which is lower than her expected benefits. My question is this: Even though she’s working and would be penalized for receiving Social Security, doesn’t it still make sense to obtain the benefit from her deceased husband? Doesn’t that benefit go away once she reaches her full retirement age?—Peter S.
If my divorced client waits until FRA to take her divorced-spouse benefits but her ex-husband claims his benefit at 62, is she forever locked into 50% of his reduced benefit? She’s a teacher making about $40,000 a year. 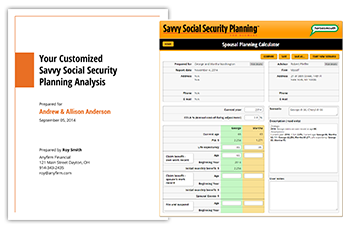 —William D.
Custom Client Reports Analyzing the Best Strategies: Our Savvy Social Security Calculator Suite allows you to create fully customized reports for clients. They can choose from the best strategies you present them. The online calculator suite includes: Spousal Planning, Simple Breakeven, Retirement Spending, Reinvest Breakeven, Divorce, Survivor and WEP/GPO Planning. ($520 value). NEW: SOCIAL SECURITY AUDIT TOOL! Savvy Social Security Planning is not just for pre-retirees who have yet to claim their benefits. It’s for anyone who suspects (or who you suspect) may not be receiving all the benefits they are entitled to. It’s happened: spouses who never added on the spousal benefit after their husbands filed; widows and divorcees from multiple marriages claiming on the wrong spouse’s work record; early claimers who still have a chance to suspend their benefits and build 8% annual delayed credits. This one-page checklist asks the questions you need answers to in order to help determine if a client is receiving all the benefits they are entitled to—and may inform the rest of your financial planning work with clients. It also provides educational opportunities when, for example, a client wants to know why you are asking a certain question (e.g., how long a previous marriage lasted). In short, it establishes you as a professional who is very thorough in addressing your client’s financial matters. Third, your clients will crave “Peace of Mind” regarding their retirement. Having received a personalized, break-even analysis of their Social Security decision will go a long way toward engendering that warm, positive feeling clients seek. Putting aside do-it-yourselfers, people are going to need and seek out advice on this crucial issue. Financial advisors are the professionals best positioned and equipped to address these issues for clients and prospects. That’s why I urge you to become a Subscriber to Savvy Social Security Planning For Boomers. Here are five key points I’d like you to consider. Your Clients Need Help. When you lead your clients through the Savvy Social Security Mastery Program, both of you are accomplishing important goals. Your clients will have experienced a real sense of accomplishment in reviewing their Social Security earnings record, analyzing their potential benefit options, and seeing how the replacement income fits with their other resources. More than nearly all client events, knowing and understanding how Social Security works and fits into their lives will be concrete, real-life information. For you, the advisor, the activity of leading people through the program confers “expertise by action.” You’ll be demonstrating your professionalism, showing people the value you add to the advisory relationship, again, in a real-life scenario. It’s a client event with an important outcome. It’s a Retirement Income Opener. Social Security, of course, is just one piece of the retirement income puzzle. By getting clients and prospects into a meeting or event to look at their personal situation with Social Security, they’re also getting a real-world view of the total retirement income picture. It all seems a lot more real and a lot less abstract and theoretical. While focusing on the “income replacement” aspect of Social Security, it naturally begs the question of what specifically the other pieces of their retirement income puzzle will be? It Will Elevate Your Position Within Your Community. People need this information. They want to know more about the program that they’ve contributed to through every paycheck they’ve ever received throughout their entire lives. And they’re not going to find anywhere else—either online or at the local Social Security office—the kind of information that you’ll be giving them with the Savvy Social Security program. You’re the Expert. Stay That Way. We already know that operational Social Security knowledge is fairly low among advisors. Many indicated they want to learn more because they see it as a real need—they’ve had questions over the years and answered them, perhaps, in fits and starts, not with the kind of confidence they’d prefer and that people should expect from a financial professional. By committing to the Savvy Social Security Mastery Program, you’re covering yourself on an important topic. As long as you remain in this business, people will have questions about this topic and your wisdom and insight will be sought for that reason. There is no better way to ensure that you achieve a high level of understanding about the key Social Security issues your clients and prospects face than by participating in the Savvy Social Security Mastery program. Year in and year out you’ll be buoyed and supported by this unique Horsesmouth program as you guide clients and prospects through this thorny first step of planning their retirement. Enhance your expertise today by putting Savvy Social Security Mastery Program into your client education program right now. You’ll be happy you did. 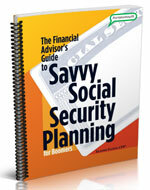 Access to the Savvy Social Security Planning Q&A Forum: Get your client questions answered. We’ve answered more than 10,000 advisor queries since 2008. Only Savvy Social Security members can submit their client questions. We answer most questions within 24 hours. 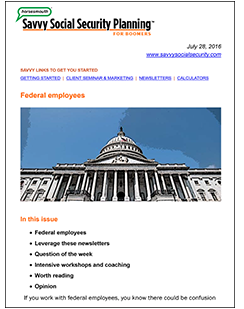 Twice-Monthly Newsletter Delivered to Your Email Inbox: Each issue is packed with information and updates from Elaine Floyd on the latest Social Security news, claiming strategies, program updates and answers to difficult questions. Social Security Audit Tool: This one-page checklist asks the questions you need answers to in order to help determine if a client is receiving all the benefits they are entitled to—and may inform the rest of your financial planning work with clients. Savvy Social Security Planning for Boomers is a key client-service offering for your pre-retirees and their friends and families. The coming retirement wave presents a unique and sustained opportunity for you to extend and enhance your reputation. Learn the program. 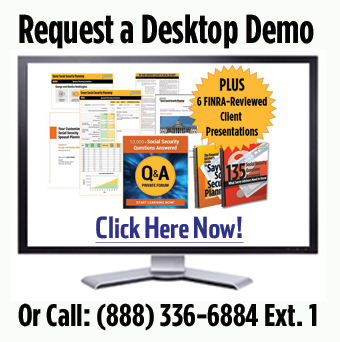 Present it to your clients and prospects. Use it one-on-one and in group settings—as a client education workshop. Do that for 12 months. If you’re not finding that your clients and prospects are extremely grateful to have a competent, confident and knowledgeable advisor guide them through the ins and outs of Social Security, we’ll completely refund 100% of your purchase price—guaranteed, no questions asked. Just call and tell us you’re returning all the materials to Horsesmouth at: Horsesmouth, 21 W. 38th St., 14th Fl., New York, NY 10018. Phone: 212-343-8760, Ext. 1.